Hello my friends I am back again with an interesting discussion amongst you. Today, we will talk about the dogecoin, which is slowly converting its reputation from a fun coin to a serious profitable coin. Dogecoin is an example of a crypto currency, which simply began on a meme joke, and it had become a primary topic of discussion in the crypto market in recent days. Dogecoin may have started as a joke but their community is now the envy of the crypto world. This can be further supported by the fact that the price of the crypto asset has easily outperformed the market as a whole, with the market falling by upwards of 20% in the same period that dogecoin essentially shot to the moon. In the span of last few weeks, this meme altcoin rose a zombie-like state to the primary topic of discussion within the cryptoworld. Dogecoin increasing dominance can also be understood by the fact that, it had now entered into the top 20 cryptocurrencies by market capitalization, with market capitalization clise to $ 670 million. 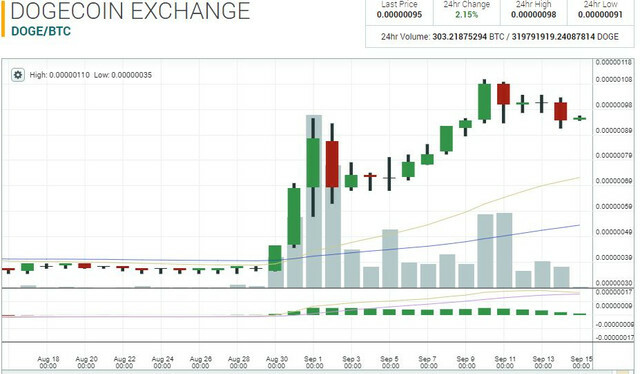 The coin recently shows up a steep hike by more than double of its previous value over the past month. It was trading at around $ 0.0025 on last week of August and suddenly a bull run arose its value upto $ 0.0066 for a whopping 153% gain. Keeping the mind-numbing figures apart, it is clear that dogecoin is seeing eye-opening levels of use and adoption, even amid one of the worst bear markets in the cryptosphere's history. Now the time will tell that, dogecoin can retains its dominance or it will again become a meme altcoin. Guys please share your valuable opinions and sight about dogecoin and its future role in cryptoworld. Shahzkool this a valuable information for doge coin earners thank you. So will we see a complete curve down till bottom again ???? only time will tell!!! I think dogger coin will rise more, my reasoning? It has a doggy picture. Everyone = 7.6 billion people on Earth. No one likes coins that have no dog pics, that's a fact. Dogecoin, noting that in 2017, the asset was seen as a joke. But now, the meme currency, which has become popular for microtransactions, tipping, and gifting in the coin's tight-knit community, is making other cryptocurrencies look like a joke, alluding the performance of the asset and the blockchain backing it. Nice topic bro , and i don't think doge will go too high, its just a little pump. sure it will happen "dogecoin can retains its dominance"
ujjawalpatel lets see what will happen bro, time will only tell what is going to be.